Until very recently, when an author’s work was copied for educational use, it was usual for that author to receive some compensation through licensing agreements. New guidelines published by a number of Canadian educational institutions claim up to 10% of a published work, entire chapters, stories, poems and articles copied for use in educational course packs as “short excerpts” covered by fair dealing. Is the copying of up to 10% of a published work, entire chapters, stories, poems and articles for use in educational course packs fair? Are educational institutions excused from the responsibility of seeking permission for, and paying for such large amounts of educational copying? Has Canadian society, with its new Copyright Act, really reached a new consensus on educational copying? Fully 86% of respondents to TWUC’s survey felt these new definitions were markedly unfair. Further, 83% anticipated that writers’ incomes would suffer because of this change. 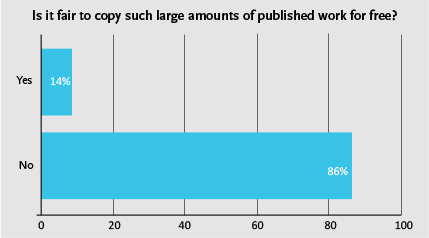 Read The Writers' Union of Canada's full report from our recent Survey of Canadian Authors on Educational Copying. It is available below as a viewable PDF, or you can just click the file attachment link and get your own copy of the report. The real work starts now. How do we get to a real consensus on educational copying? If there is to be further negotiation on the question of copying practices, amounts of copying, permission requirements and fair payment, both sides, the users and the creators need to be at the negotiating table. See more about TWUC's copyright advocacy on our Current Campaigns page.